It is your (last) chance to have the doll of your dreams. I have been very blessed with many Monah orders during this year which made it possible for me to get to know wonderful collectors around the world and make some really nice friends among them! But it's been some time already that I feel the need to go on, new projects are just boiling in my mind, waiting for me to get started. With her limited edition getting so close now, I finally had to make a decision, Monah dolls will no longer be available. Nevertheless I am willing to create the last 5 Monah dolls, giving you the chance to have yours, before I stop creating her for good. 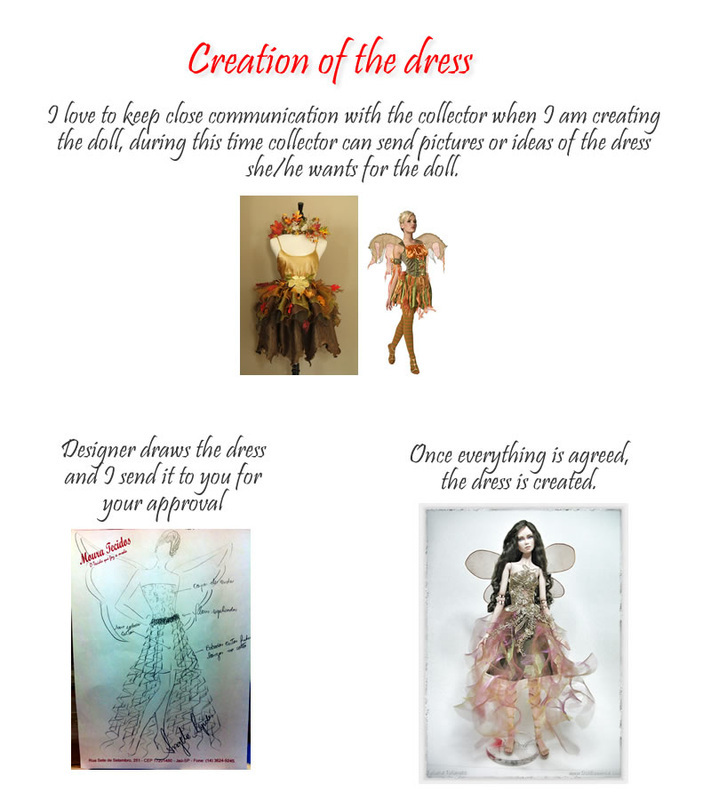 And you can even request a dress to be created for your doll, making her a ture one of a kind doll! Important: I will be working on these Special Monahs as I work with each one of my dolls: with love, care, patience. I never hurry on my creations so that I can earn more money. I believe haste and quality can't go together. These dolls are really precious and they take time and love to create. If you can't understand that I am sorry but maybe you shouldn't order one of my dolls. These will be last five Monah to be produced. Orders will be placed on a waiting list as they come, first come first served. Production time can vary from 1 to 5 months depending on where your order will be placed on the list by the moment you confirm it. A non refundable deposit of 30% of the total amount of the doll is to be paid when order is placed. The next payment is to be paid one month later and so on untill the doll payment is complete. Up to 4 payments are accepted for one doll. In case a layaway is not respected and I have no payments nor news from the collector 3 weeks after the supposed date of the payment, the doll is relisted for sale and the paid amounts will not be refunded. Only Five Specially made to order Monah dolls are available, and for the last time! please make sure you type it correctly.